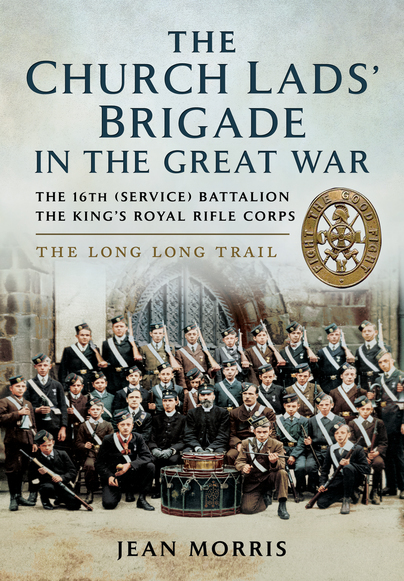 Listen to the BBC Radio Sussex & Surrey interview with Jean Morris about her book Church Lads’ Brigade, aired at 14:35 on the 17th of November. You'll be £17.50 closer to your next £10.00 credit when you purchase The Church Lads' Brigade in the Great War. What's this? It is estimated that around 50,000 Brigade Lads served in the First World War, during which many honours and distinctions were awarded. The Brigade contributed two Service Battalions of the King's Royal Rifle Corps whose members were comprised entirely of past and present members of the Church Lads' Brigade. These were known as 'Pals' Battalions. The story of the battalion centres around the experiences of eight men who served and some who died in the Battles of The Somme, Arras and The Lys. In the latter half of the nineteenth century influential Christians were worried about the poor spiritual and physical development of young people. It was at that time that 'Brigade' groups began to spring up all over the UK. Walter Mallock Gee, who was Secretary of the Junior Branch of the Church of England Temperance Society and a 'Volunteer' Army Officer, founded the Church Lads' Brigade in 1891. By 1908 the membership of the brigade stood at about 70,000 in 1,300 companies. When the 'Call to Arms' came from Field Marshal Horatio Herbert Kitchener in 1914, thousands of Britain's youth flocked to join the armed forces. Members of the Church Lads' Brigade joined up in their droves at recruiting stations all over Great Britain. Two Battalions were formed entirely from serving and ex-members of the Church Lad's Brigade. The 16th (Service) Battalion and later the 19th (Service) Battalion, both sponsored by the Church Lads' Brigade, became known as 'The Churchmen's Battalion'. In 1914 no one could have imagined the horrendous stories that would unfold from the bloody massacre at so many notorious battles across Belgium and the fields of Flanders. Ypres, Passchendaele, Somme, Arras, Lys, and the brutal decimation of the battalion during the hell of the fighting at High Wood. No one could have imagined the discomfort and disease brought on by living in a trench full of water for days on end, or 'over the top' through acres of knee-high mud. More than 24 of the Church Lads' Brigade were awarded a Victoria Cross for their bravery, but by 1918 many of those gallant young Lads would not return home. This is their story. The Author and the Publishers acknowledge that some material in this title has been taken from the website www.1914-1918.net without permission or acknowledgement and are grateful to the copyright holder, Chris Baker, for granting this permission retrospectively. It is estimated that around 50,000 Brigade Lads served in the First World War, during which many honours and distinctions were awarded. The Brigade contributed two Service Battalions of the King’s Royal Rifle Corps whose members were comprised entirely of past and present members of the Church Lads’ Brigade. These were known as ‘Pals’ Battalions. The story of the battalion centres around the experiences of eight men who served and some who died in the Battles of The Somme, Arras and The Lys. The premise for this particular book is an interesting one; rather than a straightforward battalion history, the book is based on a page from ‘The Brigade’, the magazine of the Church Lads’ Brigade battalion, dated August 1917. This page shows pictures of eight men from the battalion who had been wounded, including the author’s uncle. The book is based around her journey to find out more about these men. When I agreed to write a review of Jean Morris’s book I did not realise what a serious piece of history it was. It is not academic, in the sense of challenging history, rather it is a straightforward and carefully researched history and one that is both fascinating and readable. The book provides a detailed insight into a distinctive Pals battalion. The author pulls off the tricky task of balancing a tightly-focused study with the wider context explaining succinctly and effectively the experience of the battalion in each phase of the war on the Western Front. Of particular interest is the background details of the men who volunteered in the autumn of 1914. The pen-portraits of some of these early volunteers reveals much about the type of person of which the Church Lads’ Brigade appealed as a social, cultural and religious badge of identity. Of course, the heavy casualties these “Kitchener’s Army” units sustained, particularly on the Somme in 1916, meant that their original demographic roots were soon severely disrupted as fresh drafts from a variety of backgrounds were absorbed into the battalion in order to bring it up to strength. However, as the author shows, its original identity was never entirely eradicated and it maintained its distinctive ethos throughout the conflict. At the same time, she shows that these men went from being inexperienced, patchily-trained men into highly effective soldiers who, in the so called 100 days of 1918, were at the cutting edge of a series of victories unprecedented in the annals of the British Army. Overall, I think this means a thumbs-up from both of us for an interesting, well-researched and presented piece of writing. A significant achievement.